This major retrospective is loaded with architectural models, photographs, letters and Philadelphia architect Louis Kahn’s sophisticated pastel sketches of his designs. Was it grit or supreme ego? Whatever kept Kahn committed to his own creative genius through many lean and inglorious years, it worked. 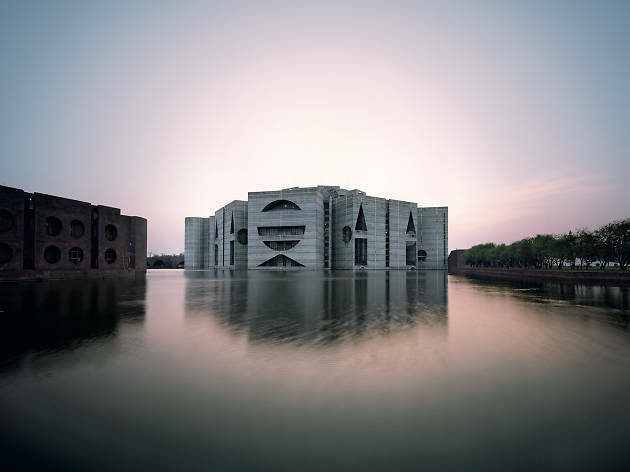 Kahn’s vision for architecture—one marked by symmetry and timeless monumentality—finally came into vogue as he entered his fifties, and by the time of his death in 1974, at age 73, he’d established himself as one of the most influential architects of the century. For such a renowned professional, Kahn has a relatively slim list of realized buildings, but the ones that do exist are extraordinary. 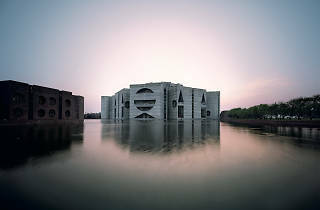 Among those that architecture fans consider worthy of pilgrimage are the Salk Institute for Biological Studies in La Jolla, California; the Kimbell Art Museum in Fort Worth; the National Assembly Building in Dhaka, Bangladesh; the Richards Medical Research Laboratories at the University of Pennsylvania; and the much-studied Margaret Esherick House in Chestnut Hill. There was nothing ordinary about Kahn’s life. At age 3, he became fascinated with the glowing coals in his family’s stove; after picking them up and placing them in his pocket, he promptly caught on fire and suffered burns that left him with permanent facial scars. A few years later, in 1906, Kahn’s destitute family arrived in Philadelphia after emigrating from what is now Estonia. Upon graduating from Central High and the University of Pennsylvania, he began his work as an architect, soon setting up shop at 1501 Walnut Street. The diminutive scholar taught at both Penn and Yale and maintained, in addition to his prolific travel and lecture schedules, three separate families—all unknown to each other. His life ended abruptly when he suffered a fatal heart attack in a restroom inside New York City’s Penn Station. The show also includes footage from his son Nathaniel’s fascinating 2003 Oscar-nominated documentary My Architect. Fittingly, Philadelphia is the last city where folks can see this globe-trotting exhibition, which was organized by Germany’s Vitra Design Museum and has appeared in museums around the world.